I had been considering this shot for awhile. Off in the distance is the Phoenix SkyHarbor airport, with this taken from the Tempe Butte (near the top), which is essentially in the middle of downtown Tempe, AZ. Immediately in back of me, is the ASU football stadium, so this is the mountain that the stadium is somewhat built into - with the "A" on the side. It's also known as cheapskate hill - at least when I was growing up watching NCAA football on TV, they would always have shots of folks sitting up on the hill in the "cheap seats" watching the game. As many times as I have flown in and out of SkyHarbor, it finally dawned on me that there might be an interesting shot from the top of the mountain (OK, its about 400 feet in elevation), with the planes landing to the west - essentially flying west, down the Salt River, over the top of the Butte and in for a landing. Depending on the runway - especially, the south most runway pattern, they can fly directly over the top of the Butte. Also, the operation reverses in the morning - with takeoffs to the east - over the Butte (which might also be another opportunity). This is not really the image that I intended - but the result of deciding not to be too stupid. I really wanted the shot to be situated on the other side of the hill with the entire view of the valley rolled out in front of me, downtown off in the distance, and the Tempe downtown (buildings all lite up) - with the flower mill directly at the foot of the Butte, etc. This is the first time I had been up there - did not really know what to expect. I found that I was going to need to scramble over a lot of rock faces - and just decided that with two bad knees, it was not worth trying that route. So, I settled on this location in the interim - an obscured view, but I thought that the top of the rock was somewhat interesting. Summer is not the best time of the year either for this shot. Even though it was 109 today, at sundown - the heat was not that bad. Blue hour was nice, but the luminance of the sky overwhelmed the lights off the planes, so they did not show up. Later in the year, when the sun goes down earlier, and with the dark sky after blue hour, would fit in much better with the traffic patterns. The operational tempo of the airport has a surge of aircraft coming in from the east coast between 7 to 8pm (been on those flights way too often). So, September, October and November would be much better. On a side note, there is a shot somewhat similar shot available over in San Diego. The planes come in for a landing down the "slot" - flying through the buildings of downtown. 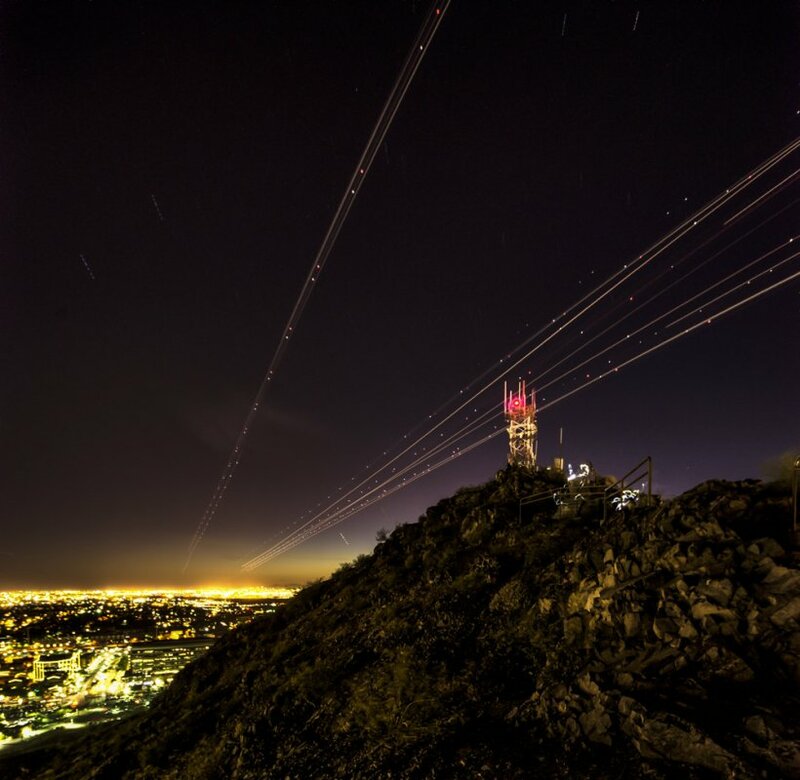 Finding the right vantage point should produce a great night image, buildings lite up with the plane tracks "flying" through them. Again, this would be a winter shot, since the sun would need to be down around 5pm, since the airport runs restricted hours - no landings after 10pm (if I remember correctly). This image is a composite of 7 images, each 30 seconds long and stacked, using the Sigma 8-16 at 8mm. I have cropped the bottom third out - as the image of the foreground dirt was pretty uninteresting. For as good a lens as the Sigma is - there was another aspect of the shot that I wanted. That was a much more well defined set of lights. The Sigma at 8mm is wide, and that does "cram" a lot of image area into each pixel. I was only able to get a segment of the city lights off to the right hand side of the shot. Two factors were at play here - the lens and also the breeze which was shaking the tripod at times. A longer focal length would really help here, say a 20mm (better defined pixels, representing a smaller area of view) - but then you would be giving away the field of view - which is at least as important as the plane lights. Also, shooting from the other side of the hill, would pull the city lights in - right up to your feet, providing a completely different perspective - especially with the building, and having better point light sources, I would think (hope) would be much better. The only way to have a wider field of view, with a longer focal length would be with a larger sensor. A full frame would do it - but I shoot with what I have, so its either a reduced field of view, as you really can't stitch with a dynamic view. Thinking about this a bit more - bumping the ISO up to 100 or 200 might help with a better point definition of the city lights - also reducing the shutter speed (20 seconds?) in order to help with the lights blooming out. Its all an experiment. Last edited by interested_observer; 06-21-2014 at 05:43 AM. Experiment or no, I'm impressed. Light trails of planes - I think you've spawned a bunch of Pentax cameras hanging around airports after dark! Just an interesting aside that I stumbled across. 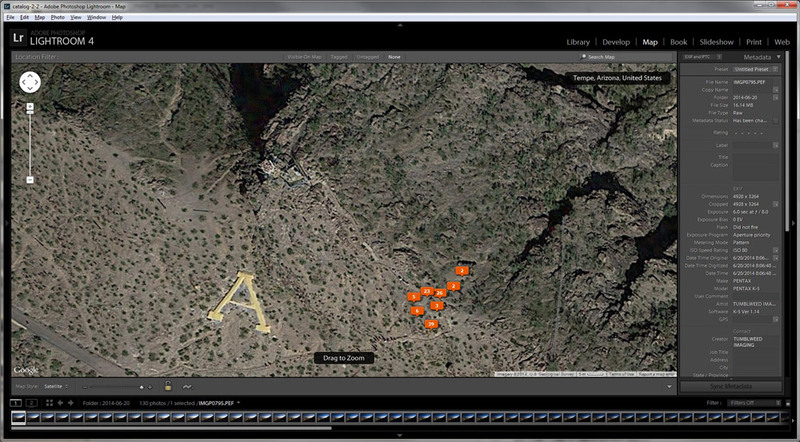 LightRoom has a map feature - where with your GPS turned on, it will map the locations where you took the images from. In looking at the map on other shoots, it was right on +/- a meter or two. This time, apparently I was sleep walking - all over the mountain. I can only subscribe it to the equipment up at the top of the hill. I could probably figure out what it is and why - but I am long past that stage, just interested in shooting. The only location I shot from was the one marked with the "3" flag, somewhat in the middle of the cluster of location icons. Across all of those markers - it represents quite a lot of distance. Next time, I need to figure out how to get up to the little plateau out along the top of the ridge out on the left hand side. It looks like there are some trails, its just picking out the right one, and just how easy it is with a backpack and tripod - in the dark (at least coming down). Actually, I should have tipped the camera up a bit more, cranked the ISO up to 12000 and shot a picture of a plane as it flew directly overhead. That would have been a good shot too. On the drive home I turned on the radio. There was some program on about "UFO" sightings across the country - glowing orange globes in the sky, and one of the items was in Mesa and Tempe AZ, just east of SkyHarbor. That kind of describes right where I was. I wonder?????? Last edited by interested_observer; 06-21-2014 at 09:08 AM.